I must say I did something pretty cruel to Eric! I’m not the practical joke kind of person, but this year I was feeling extra devious. I whipped up a couple of super salty cookies last night (I literally dumped the salt in and made sure they were gag worthy! ), and over-baked the cookies in the microwave (so they were tough as bricks). And then I left the cookies by the car keys, but I didn’t say anything to him about the cookies so he wouldn’t get suspicious. I also left him an oat square when guilt started to set in (I’m a softy!). He spotted them this morning and took both the cookies and the oat square to work, naturally. Oh man, he is going to gag when he tastes the cookies! I tried a tiny bit of the dough last night and it was so so so salty. I’m so evil. At least he has a delicious oat square to wash it down? What were we measuring for? We are putting in a SWIMMING POOL this spring! This is the model that we selected below after months of debate and number crunching. It is going to be quite exotic looking when it is all said and done and I think it will go really well with the green backdrop of the forest. It has a spa-feel that we just love. We are trying to decide what kind of rock display we want for the waterfall and if we want a big slide too. What do you think? Is this rock display too much? 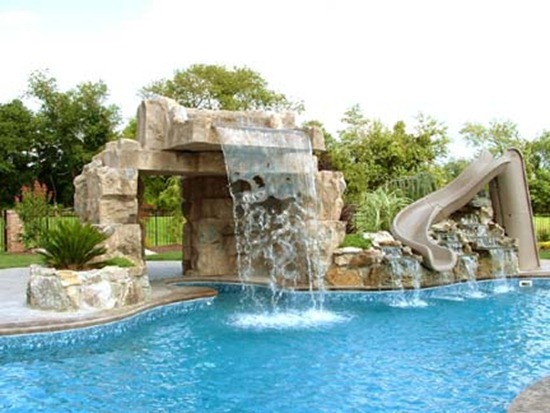 If we do put a pool in our backyard, I think it will have to be this kind…!!! Bahahaa. Could that dog look any less amused? We were actually measuring for two things. 1) We are rebuilding our deck this Spring. This is our next big reno project. We’re very excited about replacing the deck because some of the boards have rotted so much you could actually fall through them! 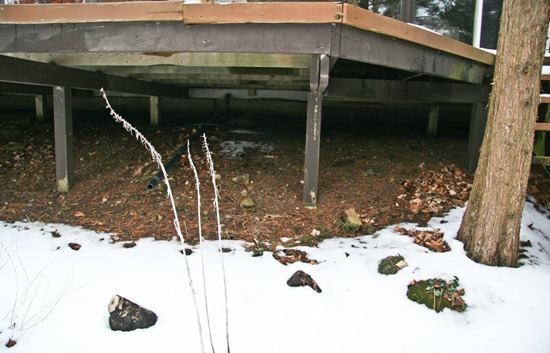 If you don’t see me for a few days, you know where I am…stuck in the deck! We are hoping that the base will be in good enough condition so we can keep it intact. 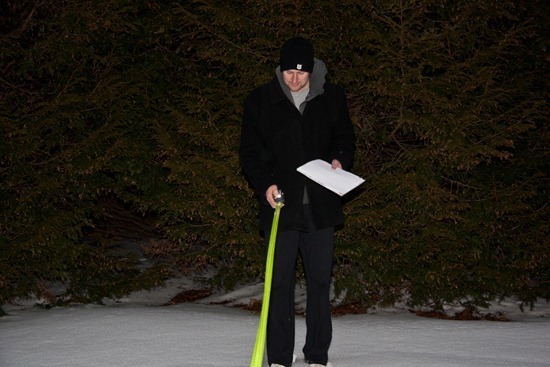 Eric has to wait for the ground to thaw a bit more before he can take a good look. Hopefully there is no rotting on the base and we can simply rebuild the top layer! That will save a ton of time and money. We are hoping to have it ready for my birthday on May 16th. We’re planning a big outdoor event with friends, so we have a tight deadline to work with. The second thing we were measuring for is a surprise, but I can tell you it doesn’t involve water! After measuring and a walk around the neighbourhood, we had a lovely dinner. This was my first time ever making Tabbouleh. I couldn’t get over how easy it was to make and how delicious it turned out! I also never knew I liked Parsley so much. I thought using Buckwheat in this recipe was a fun idea, but you could really use any kind of grain that you prefer in this dish. The recipe called for sun-dried tomatoes and I actually had some that I had been meaning to use for a while now. Unfortunately when I read the package I realized the kind I bought has sulphites in them. Sulphites give me really bad headaches, so I opted not to include them in this dish and used fresh tomatoes instead. This recipe is FOOL proof- cook the buckwheat (or grain), chop veggies, pour on the dressing ingredients, and mix! 1. Place vegetable broth or water and bouillon cube in a medium sized pot and bring to a boil. Add in the Buckwheat (or other grain) and reduce to simmer for about 20 minutes, or until tender. 2. Meanwhile, finely chop all the vegetables and place into a large bowl. Drain the Buckwheat when cooked and discard the broth. Add Buckwheat into bowl. Pour on the dressing (lemon and EVOO) and stir well. Season with salt and pepper to taste. Allow to stand for about 30 minutes to allow the flavours to develop (optional). Makes about 5-6 cups. NOTE: If using another type of grain, you might have to reduce the liquid if you don’t want to drain it. Also, I used curly Parsley but next time I would chop it much more finely than I did because it was scratchy on our throats. Granted, I used a bit too much Parsley, but it’s all good. I used about 4 cups, but I recommend using 2.5-3 cups. I also used Curly Parsley, but I don’t think I chopped it finely enough because it was scratchy on our throats. Next time I will use less and chop it much more! 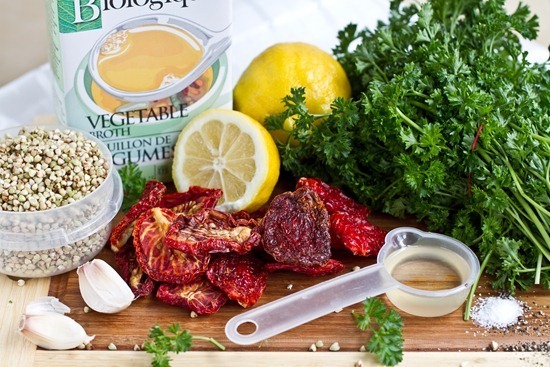 A reader also said that you can add the dressing to the Parsley to let it soak in to help soften it up. 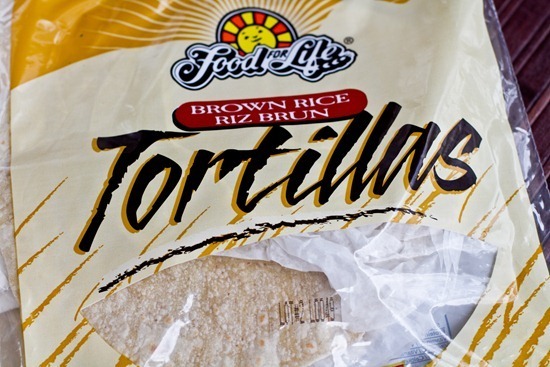 Have you tried these Food for Life Gluten-Free Brown Rice Tortillas? I spotted them at the grocery store and had to try them out because the tortillas looked so thin and pliable (two traits I love in tortillas! ), and wow I just love them. They are much less hearty than the Ezekiel kind, but I love that they are a bit thinner. Keep them stored in the freezer or they do tend to dry out quickly. 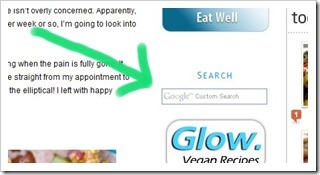 Good news- I have a NEW Search bar installed on the right side bar of the blog. The buckwheat dish looks so good! And you totally had me fooled about the pool — I just kept thinking “are they nuts?” Ok, so you’re redo-ing the deck and maybe putting in a greenhouse? That is my guess! 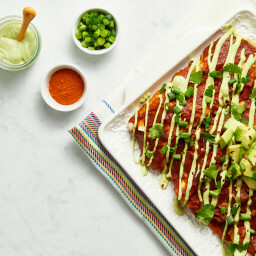 yumm, looks amazing and i cant wait to make some. good luck with the renos! Wait…I did/do believe it…so it’s not true?! …urgh you bloggers…I also believed Caitlin from HTP won the Jackpot. I was slightly – just a teensy bit – jealous and almost fainted. Totally normal. I LOVE taboulleh. In fact, I love it so much that I was eating it every day last summer and I actually developed an allergy to parsley! Now my lips swell up if I have it. Isn’t that nuts?! Word to the wise, there IS such a thing as too much of a good taboulleh. wow that is crazy!! Ive never heard of a parsley allergy before. You almost had me fooled! But I didn’t figure you were an elaborate rock-formation type of gal! LOL Would be nice though, eh? Love the tabbouleh! I’ll have to give a shot! Anything with sun-dried tomatoes is fine by me!!! I love Tabbouleh- and always add way too much parsley to mine as well (which I love, my boyfriend, not so much). I am not sure subbing italian parsley is a good idea- it has a different flavor, and is much stronger. I wouldn’t like it as much. What I do to lessen the “scratchy-ness” of curly parsley is to chop is super fine, and coat it in the olive oil/lemon juice mixture before mixing in the other ingredients- doesn’t completely get rid of it, but it makes a difference if it wilts a bit. Hilarious on the pool joke- you had me. I can never think of good April fool’s jokes in time! Hmm that is a great tip, I will add it into the recipe. Thanks! …put the parsley in a pan and drizzle olive oil over it, put it on the stove and let it get warm- not hot, only warm, it takes away the scratchy and brings out the flavor! yea they are def. chewy…it grew on me! Hehe, excellent prank!! I love the photo of the pool and think it would be AMAZING if you actually put one in.. complete with the slide AND the waterfall! Although who are we kidding… does it REALLY feel like swimming weather right now!? We can dream, right? The tabbouleh looks great! I hope you have a wonderful day Ange! I love tabbouleh-it’s so easy to make. I always make mine with barley and I add chickpeas. Num! And the new search bars works great! When I searched brownies on Tuesday night, looking for a recipe, it just came up with a recipe link. But I just tried it again, and lots of your recipes popped up. This will make my dinner time adventures so much easier! Thanks! I’m seeing a theme around the blog-world this morning… ha,ha. Loved the pool joke. Tabbbouleh looks great! I love it. hahahahahah poor Eric! but yeah, playing cruel jokes on your man is so fun from time to time ;). 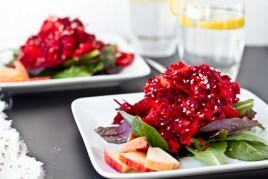 great recipe, i’ve fallen in love with buckwheat recently! I love tabbouleh – it’s a must-order anytime I go to a Greek/Mediterranean restaurant. Never heard of putting sun-dried tomatoes in it – always see the fresh tomatoes. I’m going to have to try my hand at making it myself now too! Looks yummy. Printing recipe now. Oooh, are you putting in a fence for a possible puppy in the near future?? P.S. I totally bought the pool gag. That would be super awesome, not gonna lie! ahhhaha i love the pool joke!!! yummy recipe!! i have never had buckwheat before! And HA you did have me with the swimming pool at first :p I haven’t done an April Fool’s yet, but Caitlin’s lottery one was pretty epic! She 100% had me! that cookie thing is genius! You totally had me at the pool. I even liked the first pic, then second one however was over the top! You’d better have a good dinner waiting for him! lol. I’m amazed by the renovation projects y’all take on. I can barely paint a room. 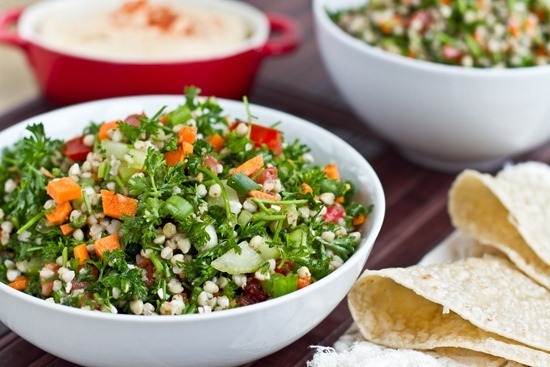 A favorite summer meal for my family when I was in high school/college, was to have a variety of summer salads — and one of them was always tabbouleh — we loved having some homemade hummus and baba ganoush with it, too. . . sitting out on the little patio, on a summer evening. That’s the life. Now I miss summer, my Mom, and homemade food. . . at least it’s Friday. The new search bar is great!!! Now it will be easy for me when I’m craving a green monster flavor to find anything you’ve made like that! What a treat!! Great post! I never know what to do for an April fool’s joke. I guess my husband knows me well enough to know that I can’t keep a straight face long enough to pull one off! A couple of ideas….I would say that you are either building an extension on to your house specifically for a new “Glo-Bakery” kitchen or you are putting in some kind of garden/green house for fresh veggies! Haha, you totally got me on the pool. It was so pretty! And I am loving those brown rice tortillas right now. So delicious! hahaha you totally got me with the pool! and you’ll have to share Eric’s reaction to the cookies! 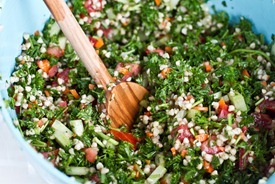 This tabouli looks so fresh and delicious! I’m super gullible, so I was really proud I hadn’t fallen for all the April Fools jokes in the blogs this morning. Until your pool trick. I was so excited for you! 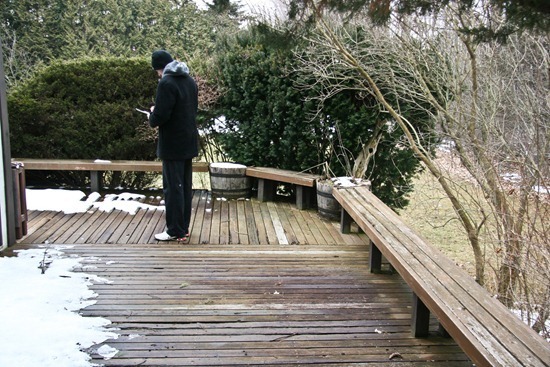 Are you measuring for a garden? Angela, this looks amazing! I am totally craving clean, classic taboulleh and hummus now! YOU DID FOOL ME! hahaha I thought “they’re doing such a great job with their inside renos…..but…..what the?” haha! AND we have the SAME BIRTHDAY! Go May 16th!!! :) its a great day if I do say so myself! Too funny, love the April Fool’s joke :) Love this! Such a healthy and delicious dish. Food for Life is great! I love both your april fool’s jokes, angela! I like your sense of humour! I put an april fool’s joke on my blog this morning but people are believing me-joke fail!!! Please tell us eric’s cookie reaction! His reaction was nothing short of amazing. Full recap coming soon! Yay I have all of the ingredients on hand im definitely making this tonight! 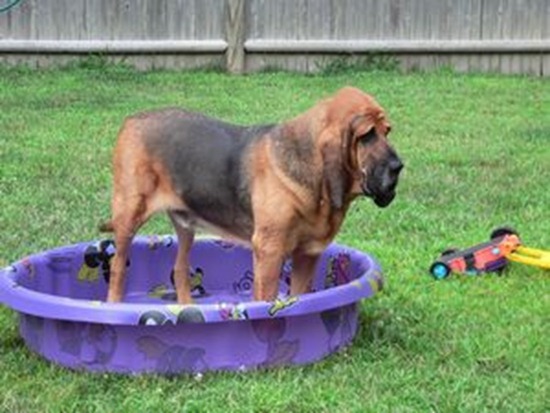 I love that pool and I am a little disappointed you are not putting it in :( I have always wanted a pool like that! Thanks Emma! :) Will check out your blog. I love tabbouleh! It is one of my fav dishes! Oooh, you are evil! But, what a great idea! I might have to try that next year (I’m not much of a prankster either). I can’t wait to hear about your deck reno! 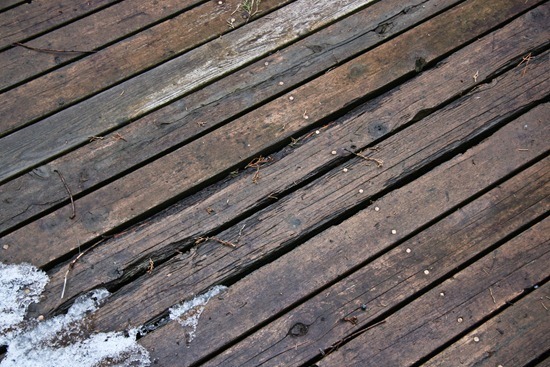 Our deck also has rotted boards and we definitely want to redo the deck ourselves, so I will be interested to hear how your process goes! you had me fooled about the pool…my jaw dropped and i’m thinkging “why would someone living in canada build such a beautiful expensive pool they could only use mayb 3 months out of the year? ?” :) good one! i love tabbouleh! its so flavorful! this recipe looks great! your Tabbouleh is sooo pretteh!!! I DO believe you that the tabbouleh is amazing though. That’s one of my favourite dishes! I totally believed you BUT I was going to leave a comment saying I think it’s a bit cold where you live for a pool! Can’t wait to find out what else you were measuring for! 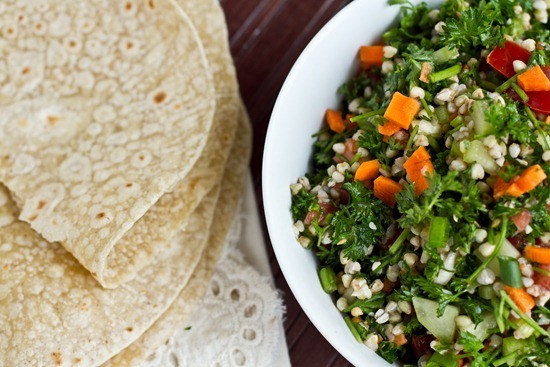 I love the use of Buckwheat in the Tabouli! A pool????? OK…I fell for it. That pool was gorgeous! You totally fooled me…until you mentioned different rock formations. hahaha I think I’m going to pick up some of those brown rice tortillas, they look good! The tabbouleh looks great, and so easy to make. I had no idea about the Food for Life Gluten-Free Brown Rice Tortillas. Thanks for the tip! I’ll be looking for them next time I’m at the store. That looks so delicious! I haven’t seen those brown rice tortillas in my grocery store, but since going gluten-free I have definitely missed good tortillas. I LOVE flour tortillas, but those are out and corn tortillas are just not a good substitute. I just finished my first package of those brown rice tortillas – I loved them!! What a good prankster you are! I was thinking to myself…Geesh, your bakery must be making you a fortune!!! The tabbouleh looks yummy – I’ve never tried making it before, but it looks easy enough to whip up as a healthy and filling dinner! 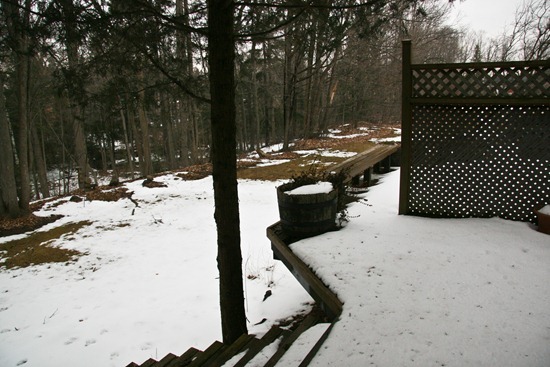 That deck will be wonderful in the summer! I eat those Tortillas almost every day!!!! LOVE THEM! :) What a great recipe Angela. I’ve never made Tabbouleh myself, but it always looks so delicious and a perfect dish to bring to parties/get-togethers. Oh his reaction couldnt have been any better!! I just tried the Food for Life Brown Rice Wraps, I love them! I made quesadiallas and they turned out so crispy! Delicious! Yum!!! My roommate taught me to make tabbouleh last year – she always made it with quinoa and/or brown rice, with mint and parsley and a few chopped olives (everything else was similar to your recipe). Using the food processor to chop the parsley and mint has worked for me in the past too – curly parsley is harder to manage than it looks, haha. HAHAHHA you totally had me with the pool! I was going to start telling you how beautiful that is. Good one! I’ve never had tabbouleh, but it looks delicious. My guess is that you are building a garden/greenhouse or a shed. But I am leaning towards a garden. Also, I am soo happy about the new search feature because it rocks! Sooo much easier to find something based on an ingredient or topic! The search recipe button works really well now!! I must try the tabbouleh, it looks so fresh! The tabbouleh looks great! I’m going to try it! This morning a friend texted me to let me know his wife was having twins. They had been trying for two years to have a baby (and are pregnant), so I thought it was possible. I msg’d him back to ask why they hadn’t found out sooner, and he said one was “hiding” behind the other. When I msg’d him with Congratulations, he finally fessed up. Luckily, I wasn’t the only one to fall for his little joke. hahhahhaha I love that joke on Eric!! you HAVE to tell us the results :D you’re cutely evil Angela~ I know i’m such a softy too–I can never hold out a joke or trick for longer than 5 minutes with my fiance. and yes! i LOVE those tortillas! they’re so easy on the stomach too, at least for me. have a blessed day! I like your idea to Eric to get him! I have to get my husband, he always beats me to it! This meals is looking good right about now for lunch. 1) Just YESTERDAY I was searching my new favourite blog (that’s yours) for recipes using cilantro since I had a bunch leftover. I only got one sad result (the very recipe I had already made, hence the leftover cilantro in my fridge.) Today, I read your post and problem solved! 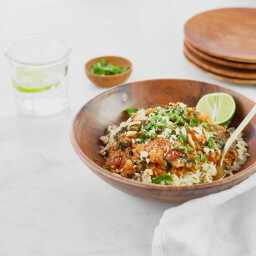 Many cilantro-y search results! Yay! 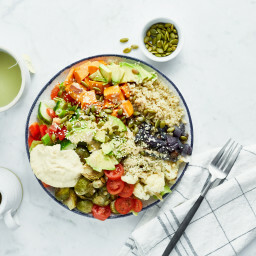 2) I just made a packaged tabbouleh last week and thought, “Hmm, this is OK but I could probably make my own version better, cheaper, and healthier.” Then your recipe arrives in my news feed! 3) My birthday? May 16! Maybe you’ll get a hot tub. Way better than a pool anyhow I think. ahahaha I love how your put so much effort into your April Fools. 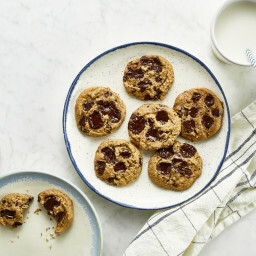 Salty cookies is a good one– I’d have trouble not ruining the trick, it’s hard for me to keep things like that to myself! Your new search bar is SO much better! It’s WAY easier to navigate now. Thanks! search bars rock. I use my own search bar on my blog all the time! Sometimes I know I wrote a post and can’t even find it altho my current one is wayyyy better than my last one. 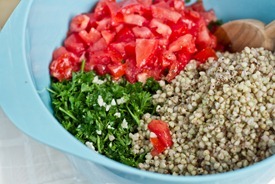 Buckwheat Tabbouleh looks delish!!! the flavors just look stellar and I love the POP of color intermixed in it. I can;t beleve you had nto made tabbouleh yet! It is so down your alley! You should next try it with bulghur because that is how the true recipe calls for. 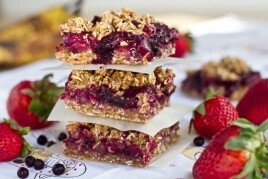 I’m in process of baking my berry bliss bars as I type. I didn’t have blueberries or even fresh berries, I used a combo of frozen cherries and frozen strawberries. I did add the banana. I added just a touch more cornstarch and the 1/4 cup of maple I found to be plenty sweet (I may even decrease next time). The filling tasted amazing! I’ll let you know how they turn out, but frozen berries work fine and I think any mix would be delicious! Thanks for the recipe. I love how it’s sweetened with the syrup and no other added sugar or fat! Wow the tabouleh looks so fresh and amazing! And thank you – your search bar is awesome now. I always struggled finding recipes I once saw before! Nice pool joke…haha! I put almond extract in my mom’s water! You totally fooled me with the pool! That salad looks so fresh and delicious! So if the deck has to be ready by your birthday, and by putting May 16th, you mean that IS your birthday…you just made me like you even more (not that I didn’t already) because is my birthday as well!! I’ve never used buckwheat, but this definitely makes me want to!! So you liked the brown rice tortillas huh? I tried them a few months ago and thought they were so dry and crumbly! To each her own though lol! 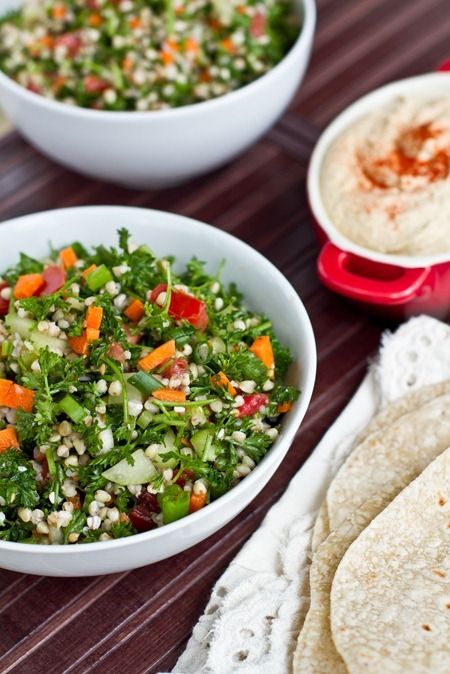 Tabbouleh is one of my fave Mediterranean dishes and your version looks scrumptious! Maan, I did fall for a pool joke! My jaw went open and I was looking at photo and kept thinking how is that possible to build. Haha! My hubby and I are thinking of building a little pond with water feature and getting some ducks in to give company to our chickens. I love your prank! I wrote a gag post on my blog too…but people are falling for it! Lovely recipe too! I like that buckwheat kernals are a little bigger than bulgur. Too bad you’re not getting that sweet pool! Although I don’t know if it’s warm long enough to get much use out of such an awesome pool! Ohh those tortillas look tasty. And of COURSE that salad looks like it could rock my world. YUM! And you had me fooled for a bit! So happy to have a Tabbouleh recipe! Made your Quinoa Pizza Balls last night (delicious)! I am looking for a good bean & quinoa veggie burger recipe (since I have a LOT of red beans leftover). You had me going on the pool too…I would have picked the first one! When I saw the pool, all I thought was…the deep freeze that is our Canadian winter will ruin that pool! I love the new search bar!!! Much more user-friendly. That looks yummy! Fortuitously my mum just made a tabouli with quinoa, instead of barley yesterday. it was nothing short of amazing (albeit that I’m a big tabouli fan!) I’m curious about sundried and carrots! I’ve always had mine with just tomato and cumber (and parsley obviously). I wonder if it’s an Australian thing? I love those tortillas. I use them for wraps all the time! I have been reading your blog for a few weeks now after I stumbled upon it while searching for smoothie recipes. I have been making “Green Monsters” for a year or so now and I LOVE them! And now I don’t feel like such a loner while drinking them! My friends think I am nuts, but every now and then I can convince my husband do drink them! The new “Search” bar ROCKS!!! I had been trying to navigate through your blog to find some recipe ideas but it would get tough. So much better now, thank you! I share a lot of the same interests as you, and it is so fun to read your great ideas. Thank you for being such a positive source of encouragement for women. It is such a breath of fresh air to read your entries, and hear about ways for women to be proud of their bodies instead of hating and punishing them! I am ditching the magazines and subscribing to your blog! I have been in love with those wraps for month, I’m so happy I’ve been seeing them pop up on the blog world more and more recently! I don’t think they actually “wrap” very well but so delicious it doesn’t even matter. That fancy pool wouldn’t get too much use in Canada would it?.. Is it a fire pit? 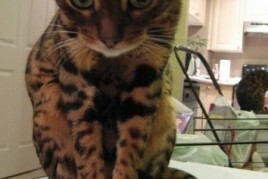 I can’t WAIT to get ours this summer. We just built a new house so we have a mud pit as a backyard. It’s horrible. Those tortillas are amazing. We use them for pizza – 400F for 10 minutes with tasty toppings. AWESOME! Oh, you have GOT to tell us Eric’s reaction! That’s hilarious! I’ve rarely eaten tabbouleh because my mum’s allergic to wheat, but now you’ve reminded me I can make it with non-wheat grains! Haha! I’m so gullible, I really thought you were putting a pool in. Fixing the deck sounds great though too. The Tabbouleh looks great. Those wraps are super good toasted too!! I always stuff mine and then press it in my gf grill! I love the crispiness! I totally forgot it was AF day, and I was thinking “why would they spend all that money on a pool when it’s so cold there… bhahahaa, jokes on me I guess.. I blame it on all the studying I’m doing! I love your blog! You and Eric are doing a terrific job on renovating your home. You totally had me with the pool!!! That is the second April fools joke I feel for this year. Have your special salty brick cookies been eaten yet?? lol. I love tabouleh but am not alsways a fan of the way bulgher wheat tastes. The buckwheat groats look good, I’ll have to buy some. Another update on the Vegan Date Squares, they are still going like crazy at work. 5 more coworkers tried them and all asked for the recipe!!! HAHA oh man, you are too funny with the salty cookies! Great gag, that is devious! And too funny about the pool. The Buckwheat Tabbouleh looks great, thanks for the recipe and inspiration on how to use a huge jub of buckwheat I have in my pantry! Hehe, you totally pranked me- goes to show how gullible I are :) You did well at that joke! Haha. But this recipe is no joke! Can’t wait to try it. I WAS a little surprised about the pool, but you fooled me! Good luck with the deck reno. You guys are so handy. Also, that’s awesome about the search function – thank you!! It’s been a long time since I’ve pulled an April Fool’s joke on anyone but I did this time and pulled it off pretty well. I actually did the same thing to 3 of my co-workers. While they were away from their desks, I strategically placed a sticky note on the bottom of their mouse, so when they tried to move their mouse, nothing would happen. It was so funny hearing the comments. LOL! I love Taboulleh and have made it myself just once and it was awesome! Even the hubby liked it and he’s a picky eater. You are too funny babe! The April’s fool salty cookies cracked me up. Did you ever think that Eric might be too afraid of being tricked again after tasting the cookies so he wouldn’t dare to touch the oat square and so he would have nothing to wash the yucky cookies down his throat with?! lol. I’d like to know if he thought you had gone mad the second he tasted the cookies…. 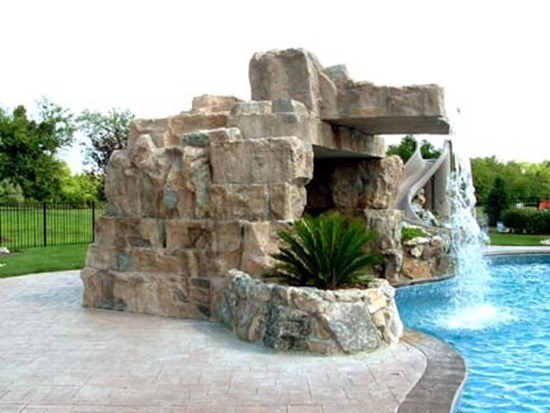 it’s always a joy to read your blog whenever i get a chance cuz your sense of humor really shines through–with the gigantic rock and pool with slide pic. miss you so much! SO crazy! I made buckwheat tabbouleh on Sunday and then I came on here to see you made it too! Great minds think alike :) I thought buckwheat was an excellent sub for bulgur wheat – which is perfectly delightful, but for the gluten free crowd or those craving a something a little different, I thought the buckwheat was excellent. You didn’t put any mint in yours? I guess not everyone likes mint, but some would argue that throwing in a bit of mint is key for a an authentic tabbouleh! You had me fooled with the pool – I was actually becoming rather envious. This tabbouleh looks so fresh and full of goodness. It’s a perfect dish to welcome spring. On the PARSLEY – curly parsley is sold mostly only in the US, and it is parsley which is good for garnish because of its looks…its flavor is very poor, compared to the real deal – flat leaf parsley. In Marocco, where tabouleh comes from, they use flat leaf parsley. I’m just starting the Hypotoxic Diet and buckwheat is one of the allowable “grains”. I love the look of your Taboulleh and want to try it as soon as I buy the buckwheat. I make a similar salad with Quinoa and Kale. To soften the kale I remove the stem, roll up the leaves and slice into very thin ribbons. Then when the quinoa is cooling in the pot I stir in the kale ribbons. They wilt in the heat, making them much more palatable. I think this would work with the parsley stirred into the cooling buckwheat. Or instead of parsley try using kale. I found your blog by googling “buckwheat recipes”. I will definitely bookmark this site and check back often. Thanks for the good read!